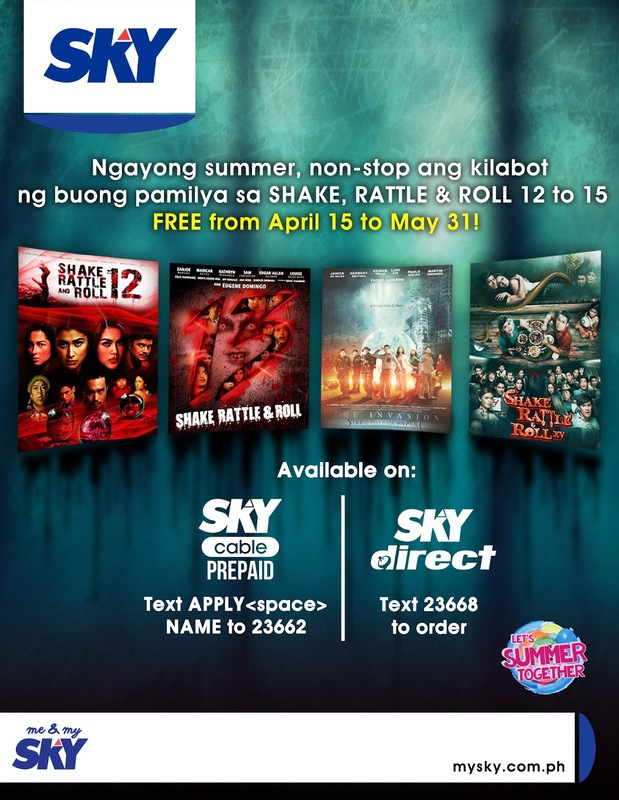 To be made available for FREE to SKYcable Prepaid and SKYdirect subscribers with load until May 31 are Shake, Rattle, and Roll 12 (2010), Shake, Rattle & Roll 13 (2011), Shake, Rattle and Roll Fourteen: The Invasion (2012), and Shake, Rattle & Roll XV (2014). The film series that dates back to 1984 is also the Filipino film franchise with the most number of movie installments, with most of it entering the annual Metro Manila Film Festival. It is available for free to SKYcable Prepaid subscribers on channel 85 in Metro Manila, CAMANAVA/Rizal, Cavite, Laguna, and Bulacan (San Jose del Monte), on channel 24 in Bacolod, Baguio, Cebu, Davao, Dumaguete, GenSan and Iloilo and nationwide to SKYdirect subscribers with load on channel 28. SKYcable Prepaid subscribers can get more info by texting PREPAID<space>11-digit SMARTCARD NO to 23662 while SKYdirect subscribers can send a text to 23668.